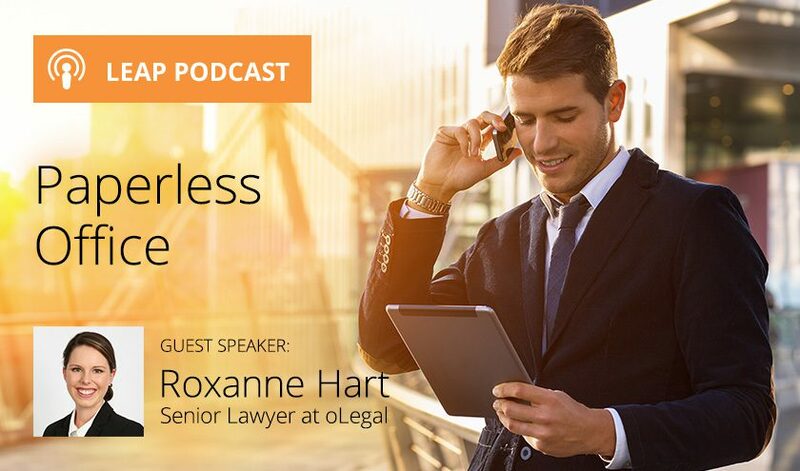 Claire James from LEAP and Roxanne Hart from oLegal discuss invaluable insights into how law firms can go paperless and the benefits in doing so. CJ: Hello, and welcome to the LEAP Podcast. I’m Claire James, National Marketing Manager at LEAP Australia. Today I’m joined by Roxanne Hart, Director and senior lawyer at oLegal, which acts for businesses, ASX listed entities and government departments. After practicing at a mid-tier firm for a number of years, Roxy started oLegal, and now provides legal services on demand to both private businesses and award-winning law firms across Australia. Roxy practices in the areas of corporate and commercial law as being recognised for her skills and client outcomes on a national level at various lawyer awards. Welcome to the Leap Podcast Roxy! RH: Thanks, Claire! Lovely to meet you, and thanks for having me here! CJ: So, first up, what does a paperless office look like? Does paperless actually mean no paper? RH: From my perspective and in my firm, oLegal, we are 100% paperless, so we do not deal with paper at all. I couldn’t even tell you the last time that I actually received a physical paper document. So, we just utilise technology and our computers and get the most value out of those, so that we don’t need to use any paper. However, I do appreciate that in a number of firms and depending on your practice area, it’s very difficult to go 100% paperless. I came from a mid-tier firm, which I worked at for a number of years, and whilst I was there the firm became paper-light. So, that firm practiced in a number of areas where it’s too impossible today to be 100% paperless, so I have seen both sort of systems, paperless and paper-light. To me, because I’m just in commercial law, I can get away with being paperless, but with other firms they can definitely be paper-light and really cut down the amount of paper that they’re using.